After watching the two episodes of Zyuohger and it's not just a toy commercial like the previous episodes. So there are others doing episode by episode reviews which I won't do copy/paste and I may not be able to commit myself to it. But the past two episodes somehow started to give me pieces of nostalgia and something fresh... or not. Can't really tell what's going on but I'm really optimistic even after Kyoryuger, ToQGer and Ninninger were really failing to impress me. Considering the events that Genis decides to participate in the game in some way, he releases a new sick game. He decides to throw his own blood game perhaps tired of the constant failures of his generals. Celebrating Earth Day, Super Sentai Style! It's time to celebrate Earth Day, Super Sentai style. It's the 40th Anniversary of Super Sentai and we have the Zyuohgers protecting the Earth on Sentai's 40th anniversary. We've also had other Toei heroes such as Kamen Riders, Metal Heroes, Power Rangers and other Tokusatsu shows under them doing their job in their storylines. 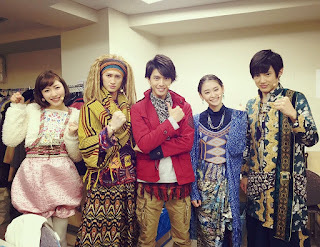 But I'll focus more on Super Sentai for the 40th anniversary. The theme of Super Sentai for most of its run is really saving the Earth from destruction from various enemy forces that threaten it. 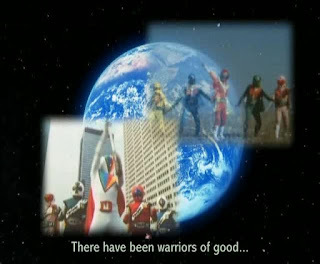 Gaoranger vs. Super Sentai made it clear in the beginning of the crossover movie that Earth has been attacked by various villains. 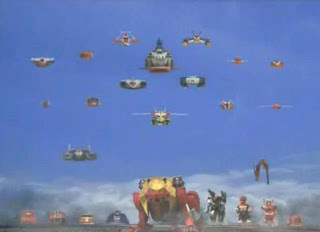 The villains of Super Sentai all appear with one motive after the other which some of them seek to destroy Earth, others seek to dominate it but regardless, it's been the fight for Earth. So let's get started, shall we? It's time for DYNAMAN! Oops wrong tagline! That was long ago when I enjoyed viewing the Dynaman Parody Dub. What's a pleasant surprise was that while Millionfold Curiosity is subbing Gavan (and they've got 24 episodes available, woohoo!) is that they've released Dynaman's first nine episodes. Well it's time to say goodbye Dynaman Parody Dub and in for the real deal. More Mecha May Mean Less Intense Action Scenes? By observing some old school and new school Super Sentai, I tend to notice that there seems to be this trend that if there's more mecha into the show then you might as well expect lower quality or less intense action scenes. I'm writing this considering Zyuohger has brought in back the badly needed DYI stunts from the main cast (with ToQGer and Ninninger really lacked), now it's time to go backward and forward with Super Sentai. As said, just because a series is newer doesn't mean it's always better. Sometimes, you get a good season succeeded by a bad season and a bad season succeeded by a good season. As a child, I remembered all that confusion I had when watching Mighty Morphin' Power Rangers without knowing its origins (because I was too lazy to read the credits as a child) introducing the dinosaur type mecha (Dinozords) was a deviation from the standard use of vehicle mecha. It wasn't until later I discovered post-Jetman Super Sentai and pre-Jetman Super Sentai that started my journey of "zord evolution". How Often Are Rangers Willing To Have A Prolonged Fight With A Monster Of The Week Out Of Suit? Something about Super Sentai, Power Rangers and Kamen Rider may have the typical, "Let's fight those foot soldiers out of suit!" scenario but not everyone is really going to dare to really have a prolonged fight with a monster of the week OUT OF SUIT! Such a stunt can be considered as either foolish or brave by the viewers. 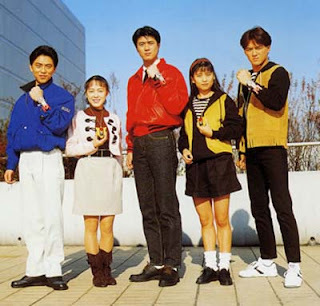 Looking back at a few episodes of older Super Sentai, something never got off my attention back then like Momoko in Maskman fighting Dokura Dobler out of suit to teach some children the value of perseverance. Later, we'd have Ken Hoshikawa beat Amoeba Rugin out of suit. Yes, a lot of characters do their stunts out of suit but question is, how many of them were willing to beat up a monster completely out of suit? So it's belated Happy Siblings' Day. 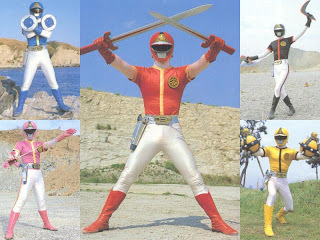 So let's get a bit of walkthrough of the three family Super Sentai for each decade. In 1990, we had Chikyu Sentai Fiveman which was the last time Hirohisa Soda was going to be a head writer. This show is very much an important part of my childhood since I grew up watching it. Much of the show featured a more unique team because they're freaking siblings! It wasn't like with all the others that I saw before it like Bioman, Maskman and Turboranger that didn't feature a family. Fiveman had the first sibling force as the year 1990 entered. 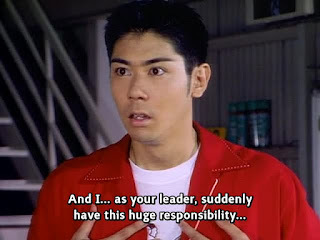 The story itself tried to combine plenty of Soda's past works but he was basically wearing out already after spending some time as the head writer for Goggle V up to Turboranger. After watching Carranger for some time, I thought that the show had some really badass action. Turboranger had some badass action but I felt Carranger may have taken it to another level. The mission was to recover RV Robo after they had VRV Robo. Gynamo resumes command and has used RV Robo to defeat the Carrangers. In this episode, the monster of the week Z.Z. Gyuri was tasked to grab some cucumber kimchi for de-facto leader Zonette. After writing that I'm actually feeling positive for Zyuohger so I might do some weekly or monthly updates on the show (though UkiyaSeed's been beating me to that considering Orends Range is a news blog), but I'd really give my thopughts yet again. It's been just eleven episodes but the show's starting to show some improvement from the last three seasons namely Kyoryuger, ToQGer and Ninninger. The cast may not be the best but I find them better. Yamato's not be the best but at least he's no idiot or attention grabber and even if the rest are naive (because they're stuck in a world not their own) but they're a good cast of characters. Well the sixth ranger is already part of the expectation so I won't discuss much on it. More of the cast doing a lot of their own stunts and not getting too stuntman reliant. After seeing Judd Lynn's return to Power Rangers for the current season Dino Charge and the fact he's a Go-Busters fan (no surprise there, he was after all RPM's replacement writer), I also thought that in some way that he has some similarities with Yasuko Kobayashi. 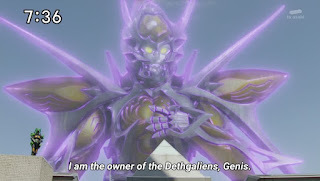 Just think one year after Kobayashi was the head writer of Gingaman, he becomes Lost Galaxy's head writer. Kobayashi was also an important secondary writer for GoGoV and the head writer of Timeranger. Lynn was the head writer for Time Force. It might be safe to assume that both of them are beloved writers in their franchises. Lynn was the head writer for Power Rangers in Space while Kobayashi was an important secondary writer for Megaranger. It's time to take a look at some of their similarities. After watching Zyuohger's villains doing the Blood Game, some entries of the Super Hero Taisen film series and remembering the Super Robot Wars series gave me the thought that the Super Hero Taisen film series is better off as a video game series than a movie series. The Super Hero Taisen film series really ticks me off execution-wise but idea-wise, the concepts are really not bad at all! 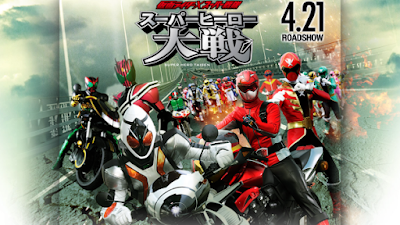 Creating what may be considered as the "VS. Universe" for the crossover series might as well create a Super Hero Taisen Universe exclusive to the video games.